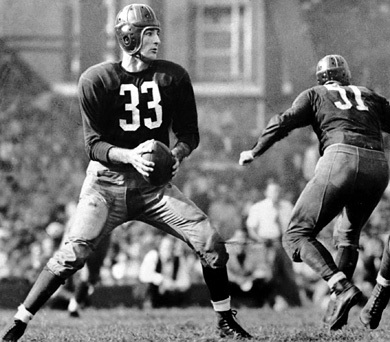 Sammy Baugh, one of the greatest quarterbacks in history, passed away this week at the age of 94. In a list of top 10 all-time quarterbacks presented by The Sportslifer earlier this year, Baugh was ranked eighth overall, sandwiched between Roger Staubach and Bart Starr. Johnny Unitas leads the list. Slingin’ Sammy dominated the late 1930s and 1940s, winning six passing titles, two NFL championships, and nine All-Pro berths. And if that wasn’t enough, he could punt too….very well. Baugh spent his entire 16-year career with the Washington Redskins. He won NFL championships in his rookie year and again in 1942. His greatest year was 1943, when he led the league in passing, interceptions (with 11) and punting. In one game that year, Baugh threw four touchdown passes and intercepted four passes. When he retired following the 1952 season, Baugh had thrown for 187 touchdowns and held virtually all major NFL passing records. During the 1945 season, Baugh completed 128 of 182 passes for a 70.33 completion percentage, which was an NFL record then and remains the second best today (to Ken Anderson, 70.55 in 1982). And In 1940, he averaged 51.4 yards per punt, still the NFL single-season record. Baugh was in the inaugural class of the Pro Football Hall of Fame, one of 17 inductees and the list survivor from a list of legendary players that includes Red Grange, Bronko Nagurski and Jim Thorpe. In 1994, the NFL named Baugh as one of four quarterbacks on its 75th-anniversary team; the others were Otto Graham, Johnny Unitas and Joe Montana. A graduate of TCU, Baugh led the Horned Frogs to wins in the 1936 Sugar Bowl and first-ever Cotton Bowl in 1937. In 2003, College Football News named Baugh the third best college football player in history. He was also the first coach of the New York Titans (later the Jets), posting successive 7-7 records in 1960 and 1961 when the team played at the Polo Grounds. Baugh’s 14-14 record was a Jets best until Bill Parcells went 29-19 between 1997 and 1999. A tale from Baugh’s rookie season in his New York Times obituary typifies his uncanny passing capability and self-confidence. Baugh was taking the field for his first practice session with the Redskins when his coach, Ray Flaherty, handed him the football. “They tell me you’re quite a passer,” Flaherty said. “I reckon I can throw a little,” Baugh replied. Joe Cool, a third-round draft pick out of Notre Dame, won four Super Bowls in nine years with the 49ers in the 80s, 45 playoff touchdown passes, and five passing titles. He was an All-Pro seven times. All-time QB leader in virtually every category, including consecutive games started (253), wins (160), touchdowns (442), completions (5,377) and yardage (61,655). This Packer legend did it all with a certain joie de vivre. Lifelong Dolphin set many standards later broken by others. His record 48 TD passes in a single season snapped by Peyton Manning and Brady; Favre broke his career record of 420 TD passes last year. Talk about championship pedigree, Graham played for the league title in each of his 10 years in pro football, four in the AAFC and six in the NFL. A 10-time All-Pro, he won seven league championships. This gunslinger from the Rockies played in five Super Bowls and won rings in his last two years. Noted for nearly 50 fourth quarter comeback wins, he’s fifth all-time with 300 passing TDs. The sole Heisman Trophy winner on this list (in 1963), this Navy graduate, aka Roger the Dodger, won two Super Bowls and five passing titles, and was named All-Pro five times. Starr quarterbacked the great Green Bay dynasty that won three NFL championships and Super Bowls I and II. The leader of Pack scored the winning TD in the Ice Bowl, and won three passing titles. A number one overall pick out of tiny Louisiana Tech, Bradshaw led the Steelers to four Super Bowl wins in a six-year stretch. A three-time All-Pro, his pass helped author the Immaculate Reception in 1972.